Traditional Chinese Medicine (TCM) has a rich history of over 5,000 years. Through understanding its principles we can learn to decipher all the messages our bodies have been sending us and gain wisdom for tending to our own needs, physically and emotionally. Topics include: Yin/Yang, Five Elements, Lung/Large Intestine, Kidney/Urinary Bladder, Liver/Gallbladder, Heart/Small Intestine, Spleen/Stomach, and Pericardium/Triple Warmer. 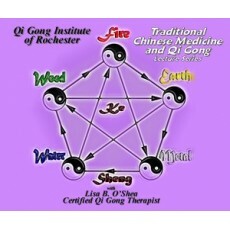 This four CD audio set covers over three and a half hours of lectures on TCM from a Qigong point of view recored live in 2009 by Lisa B. O’Shea, Certified Qigong Therapist and Instructor and founder of the Qigong Institute of Rochester.